If capital preservation is your goal, then I believe the single hardest part of portfolio management is thoughtful preparation for the end of the cycle. I know I worry about this a lot, but to me it’s worth it if I can avoid ever having to say, “Sorry but I lost half of your money.” However, a fifty percent loss is just what the broader indices suffered in each of the last two equity downcycles. Yet here we find ourselves overdue, now fully ten years into a cycle whose average length is nine and a half years. How best to invest defensively? Get defensive too early and your caution may weigh upon your returns, that can feel (almost) as bad as getting blind-sided by the end of the cycle. In today’s “Trends and Tail Risks” we outline why we think select investments in the mortgage REIT sector pay us while we wait for the cycle’s end, thus making it easier to add welcome late-cycle ballast to our portfolios. Sometimes the best way to understand what something really IS, is to start by explaining what its NOT. Defensive investing is not market timing. I have never seen credible proof that anyone can time the market. That is why we have never, and will never, advocate jumping in and out of the market. Nor have we ever, nor will we ever, make a “market forecast.” Those are worthless. You can try, but in my opinion, it is a near certainty that you will be wrong very often. One thing you can count on, however, is that the attempt to trade on such a plan will cost you money in trading, taxes, and other frictional costs. All these costs lower your returns. Isn’t there a better way? We believe that portfolio construction is that better way. This means you can be more fully invested at all times, which means that your money is always in the market working for you. But clearly, as we get later into the cycle, you must be thoughtful about what risks you are taking with your money. Long-time readers of our research publications will understand that we don’t make investments without thinking – before we invest - about what could go wrong. This is a part of our research process for every investment that makes its way into the portfolio. Our goal is to own a more defensive mix of investments as we get deeper into the cycle. Readers may also recall specific examples of what we believe are investments placed into the portfolio specifically because we believe that they may act as a hedge during times of market stress. A partial list of such investments would include 1.) gold related equities, 2.) stocks that benefit from credit distress, 3.) higher quality bonds, and 4.) longer-dated U.S. government treasury bonds. Today we describe mortgage REITS, another class of investment that we believe can add defensiveness when your portfolio needs it most, during the common disaster of a periodic recession. Recessions, which tend to take place every 6 to 10 years on average, can be devastating because they take companies’ earnings down - all at the same time. Falling earnings often means falling stock prices. However, if we can succeed in our goal of owning a growing defensive mix of unique investments, that can thrive during these common disasters, it should result in better performance when our clients need it most. Below we outline the four reasons we think select mortgage REITs can do this valuable job. Before we describe what we think are the merits of these businesses, we wanted to summarize how their businesses work. The chief way a mortgage REIT does business is to own a large portfolio of fixed rate mortgages, and to finance this portfolio by shorter term borrowing. Mortgage REITs have four useful attributes that combine to make them a worthy inclusion in a defensive portfolio. First and most importantly, they pay their owners while they wait in the form of a high dividend. Investors call this “positive carry.” Note how different that is from traditional forms of “negative carry” hedging, where investors write a check to someone else to make a certain risk go away, such as writing a check to an insurance company to insure your home. We believe that each time we can find a positive carry hedge, we are winning an incremental victory for investors in the form of a better return. These little wins can add up to big money. That is the power of elegant portfolio construction, which in my opinion is the hardest thing in investing to achieve. Second, the fundamentals of properly managed mortgage REITs can improve when the rest of the equity market is doing poorly. How? Because the Fed tends to cut interest rates in a recession, and that can be a good thing for mortgage REITs, as the chart below suggests. 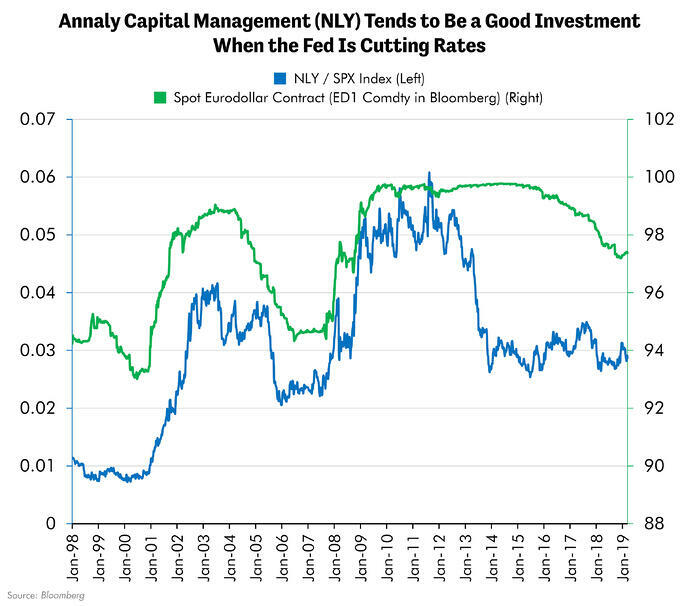 In this chart, we show the performance of NLY – the leading mortgage REIT – versus the price of Eurodollar contracts. Both have tended to rally when the Fed is cutting interest rates. (Note that Eurodollar contracts rise in price when interest rates fall.) Let me take a minute to explain how falling rates can help. The Fed cutting rates helps mortgage REITS in several ways. Falling short term interest rates lowers the cost to fund the mortgages in which the REITS are invested. Also, falling interest rates often lead home-owners to refinance their mortgages, which means paying off that mortgage at par value. Even with this refinancing, a mortgage REITs’ portfolio of mortgages still has a longer duration than that of the money it borrows to finance its ownership of mortgages. This can lead to a rising asset value of the company’s portfolio of mortgages. This explains why NLY performed so strongly into the teeth of the 2000-2002 recession and the global financial crisis that ended in 2009. These three drivers can combine to create a remarkable feat: an expanding valuation during a recession! 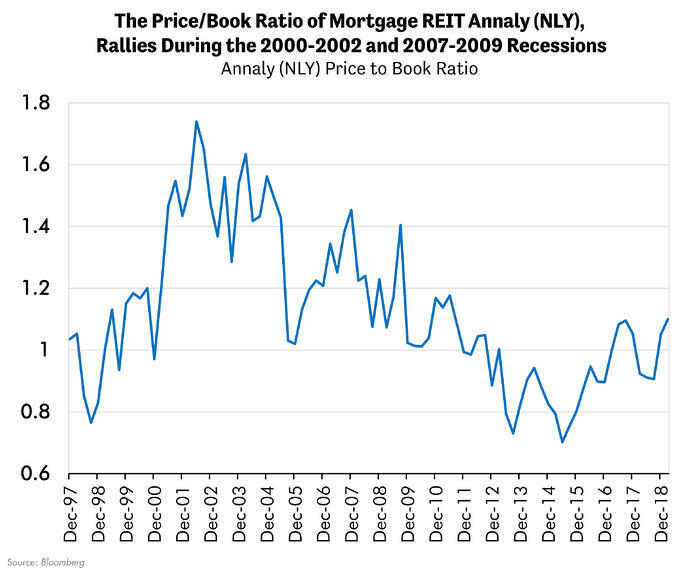 Look no further than the chart below which shows how the price/book ratio of Annaly (NLY), a leading mortgage REIT, expanded during 2000-2002 and 2007-2009 – during a recession when precious few investments prospered. You can search for years and never find investments with a history of doing better during recessions. I have spent my career seeking them out. After twenty years of looking, I have only managed to find a handful. We own them all. A third reason we think mortgage REITs can be a good investment is that we believe they are attractively priced now, trading close to book value. We believe that one of most important steps we can take to manage risk is to invest in securities with cheap valuations, because we believe this lowers the downside risk in our investments. Fourth and finally, we wanted to highlight what we believe are the diversification merits from mortgage REITs. The best portfolios, we believe, are composed of investments that have a different pattern of returns. Where each individual position has a role to play. Our goal is to avoid the trauma of a portfolio that does great in a bull market, a “Happy Face” portfolio that turns, in a bear market, into a horribly performing “Frowny Face” portfolio. We want to do better. One of the best ways to build a better portfolio is with assets whose returns do not move together. The fancy term for such uncorrelated assets is called “low beta” versus the market. Mortgage REITs such as Annaly really deliver here, with a beta of 0.16, from 1996 to 2019, which is exceptionally low. Risks: If We are Wrong about Mortgage REITS, Why Would we be Wrong? As with all investing, there is no return without risk. Many mortgage REITs use borrowed money as “leverage” to increase returns by owning a larger pool of mortgages. Leverage can be tricky, especially if it is poorly managed or if short term funding costs spike. Arguably both above accidents hit the mortgage REITs during late 2008, and yet the sector still strongly outperformed the broader stock market. Furthermore, our enthusiasm for select mortgage REITs is driven by our views that we are late into the interest rate cycle and getting closer to the time when the Fed may begin to cut interest rates. Should this assumption prove to be misplaced, such investments may languish for longer than we anticipate, but do not appear to be at undue risk. There is a reason behind each investment that we own. The investments that we get the most excited about have the benefit of strengthening our total investment portfolio through better diversification. Our long career in the investment research business has taught us that thoughtful portfolio design, while never easy, can be one of the most impactful goals we can seek. When a portfolio works best, it is much more than just a random assembly of “best ideas” but rather more like a symphony, with all its individual pieces working in harmony. This is not an easy goal to achieve – but no one ever said successful investing was easy!